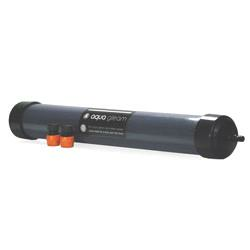 Aqua Gleam 0ppm De-ionising Water Filter - 30"
NEW - Longer Aqua Gleam Filter - FREE DELIVERY!! This larger version is approx 2.5 times longer than the standard version. 30ppm - Water at this purity level will provide good spot-free results and meets the requirements of even the most demanding users. In areas with particularly hard water it may be preferable to use a 30ppm filter rather than the 0ppm filter in order to prolong filter life. 0ppm - Water at this higher level of purity will provide the best possible results and meets the requirements of the most exacting users. Have been looking at these for a while now and was a little undecided. I took the plunge and ordered, it arrived quickly as always. I bought the wall clamps as well so mounted it in a dark area in the garage as recommended. Very easy to install and easy to use. Excellent results water just runs off and dries quickly with no need to use a contact method for drying! I was that impressed I ordered the 30ppm as well to sit before the 0ppm to make it last a lot longer. Highly recommended. Used this filter for the first time today. I have a digital water hardness meter and was preparing myself to be disappointed with the results. But I am very pleased to be able to say that after testing the water before and after the readings are amazing! The water in my area is extremely hard, about 380ppm. I do use a couple of 10" resin filters in-line before the Aqua Gleam filter. These bring the hardness down to about 200ppm. But after the water has then passed through the Aqua Gleam filter the reading is absolute zero!!! I am sure these readings would be just as good even without the resin filters. This filter is a must for darker coloured cars and i can't recommend it enough. Especially useful during winter when u need to wash your car frequently and can't be bothered to dry it. It will be a God send in summer too when the water is drying on the paint quicker than you can remove it. Brilliant product, has to be seen to be believed!!!!! Hi, I have been looking at these filters for a while but was not convinced they were worth the money, anyway having read a couple of independent reviews decided to bite the bullet and try one. Arrived yesterday and as it is quite a nice day, warmer than I would usually wash bikes/car thought it would be an ideal test day for the filter. Test one - Washed the car (Audi TT) and rinsed with filter left to dry and sure enough no watermarks. As this is a soft water area watermarks are not a huge problem but I would not normally let the car air-dry and certainly not on a warm fairly sunny day. Top marks. Test two - The real test for me is for the bikes, I have several and the worst ones to wash are my Harley Davidson’s, lots of chrome and very difficult to dry (I use a Meguiar's waffle weave). Washed the bike rinsed with filter and left to dry. Very few water marks where normally there would be dozens, good but not perfect. Now the really interesting bit. Test 3 - Washed other Harley and rinsed with filter, then dried with waffle weave cloth. Unbelievable...best result ever on the bike. For those that have bikes you will appreciate that you always get water marks around the chrome engine casing screws even when drying with a cloth, with this filter and drying with a cloth no water marks whatsoever.... I am a convert will never wash the bikes again without the filter. I will still dry the bikes with cloth so filter will not save me time or effort but something that improves the quality of the end result is well worth having..... Hope this is of some use for anyone thinking of trying the filter. Heard about these filters a while back so thought I'd give it a go. It does do what is promised leaving an excellent finish. I think the suggested water requirements are for the smallest of cars - we have a 4WD pick-Up truck and I certainly needed far mor than the suggested '10 Litres' to rinse it off. Would be excellent for custom motorcycles !!!! Just have to wait and see how long the filter lasts to decide on value for money.